With 2014 just around the corner, two of the longest standing women’s professional teams have announced their final rosters for the coming season. Hitec Products will be entering its sixth season at the top level of the sport, with Team Tibco-To The Top starting its tenth year, with the last five at UCI level. 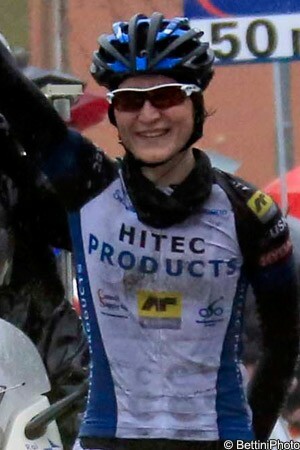 The original announcement from Hitec Products omitted the name of the team’s biggest rider, in Italian Elisa Longo Borghini (pictured) but, after a query from VeloNation, team manager Karl Lima confirmed that the team would once again be built around the talents of the Trofeo Binda winner. The Norwegian-registered team loses Swedish champion Emilia Fahlin to Wiggle Honda, Italian Rossella Ratto to Faren-Kuota, Rachel Neylan returning to the domestic Australian peloton, and Lise Nøstvold retiring. These have been more than offset, however, by the signing of South African and African champion Ashleigh Moolman from Lotto-Belisol, Australian Lauren Kitchen from Wiggle Honda, Audrey Cordon from Vienne-Futuroscope and young Swedish prodigy Sara Olsson. Tibco-To The Top has shed several of its big riders from the 2013 team with Meredith Miller leaving, Chantal Blaak transferring to Specialized-lululemon, Rushlee Buchanan to UnitedHealthcare, Claudia Häusler to Argos-Shimano, Shelley Olds to Alé-Cipollini, Irish champion Melanie Späth to the expanding Danish Rytger team. Nevertheless, the American team enters its tenth year with an ambitious array of signings that include Andrea Dvorak from Exergy-Twenty16, Emma Grant from Matrix Fitness, Patricia Schwager from Faren-Kuota, and Anika Todd and Scotti Wilborne who step up to UCI level for the first time. “2014 marks our 10th year of racing,” said Tibco-To The Top founder and manager Linda Jackson. “I believe we are now the longest running women’s cycling team. We’re proud to have had the support of Tibco and SVB throughout this period. Our longevity and success is because of their continued support of women and cycling. While it is currently short on detail, the BePink team has announced a partnership with the Astana men’s ProTeam, and will apparently be called Astana-BePink in 2014. The Italian team has lost its biggest name rider, with the retirement of former Italian champion and Worlds medallist Noemi Cantele, but holds on to current tricolore Dalia Muccioli, Swiss champion Doris Schweizer, Silvia Valsecchi, Alice Arzuffi and Simona Frapporti, as well as signing Anna Stricker from Cipollini-Giordana and Susanna Zorzi from Faren-Kuota.